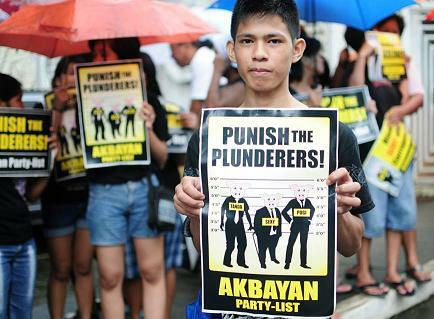 Amid the raging debate on the Disbursement Acceleration Program (DAP), Akbayan partylist today warned the public not to be swayed by efforts from some quarters to use the issue to deflect attention on the plunder charges filed against several lawmakers involved in the multi-billion Janet Lim-Napoles pork barrel scam. “Even as we seriously express our alarm and concern on the DAP, we should not forget that this issue was first raised by Senator Jinggoy Estrada, who together with other lawmakers were caught with their hands in the cookie jar. This is clearly an attempt to distract the public from the immediate objective of exacting accountability for their colossal crimes,” Akbayan Rep. Barry Gutierrez said. 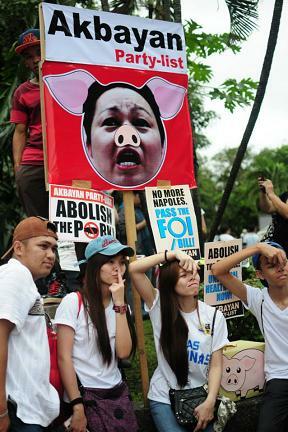 “The public must not fall for Estrada's diversionary tactic. We cannot realize our strategic reform goals if the immediate task of punishing these transgressors is sidelined,” Gutierrez said. However, the left-leaning ally of President Aquino reiterated its call on Congress to “regulate, streamline and limit” his fiscal powers. Akbayan said that together with the call to abolish all forms of pork barrel, clipping the immense fiscal powers of the Executive is part of the greater budget reforms that are needed to give the public greater participation on how public funds are allocated and disbursed. “We reiterate our call to Congress to regulate, streamline and limit the Executive’s fiscal powers. While we agree to DAP’s intention to accelerate or increase state spending to social services to immediately boost economic growth, the DAP issue points to the Executive’s twin fiscal powers to impound and realign savings. With these powers combined, it is practically the same as the power of appropriations itself – a power which should be solely exercised by Congress,” Gutierrez said. Gutierrez also took exception to the allocation made to several senators sourced from DAP. “Accusations of misuse, real or perceived, could have been easily avoided if government simply allocated the savings to the agencies themselves,” Gutierrez aid. As a strong legislative response, Akbayan said it will press for the passage of House Bill No. 2256 or the Savings and Augmentation Bill and House Bill No. 2257 or the Impoundment Control Bill. The progressive political party said that the Impoundment Control Bill aims to regulate the Executive's authority to defer, rescind and reserve expenditures already approved by Congress. It explained that uncertainty about the release of funds makes other branches of government vulnerable to being strong-armed by the Executive as the deferment, recession and reversion of funding becomes a tool for political manipulation. On the other hand, the Savings and Augmentation Bill seeks to prevent the unscrupulous practice of realigning so-called savings to dubious allocations or reallocations. Akbayan said President Aquino must certify the bills as urgent, asserting that the issue must be taken as an opportunity to address the budget system's institutional weaknesses. "We must use this occasion to energize our call to advance fiscal democracy. And while these bills will definitely trim down the present Executive's fiscal power, we are confident that President Aquino will see that this is part of the over-all campaign against corruption and impunity,” Gutierrez said. 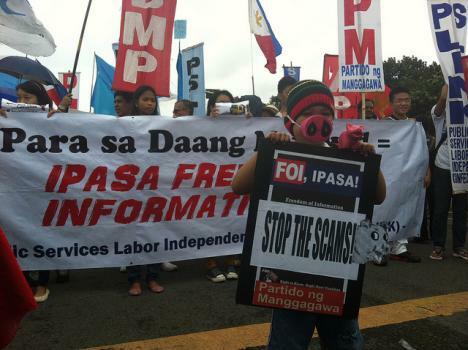 Akbayan also called on the Aquino government to come out with a full and extensive explanation of the mechanisms and processes surrounding DAP and disclose everything. “This is the time for thoroughgoing reckoning and reform. We call on the government to fully explain and disclose everything to assuage the understandable suspicion and fear from the public. The people can no longer be left in the dark regarding issues that have to do with their money,” Gutierrez said. The group also called on the Executive to allocate future government savings pooled by DAP directly to agencies instead of channeling it through lawmakers. "While we push for the realization of the necessary legislative policies to regulate the Executive's fiscal powers, in the immediate, we call on the government to allocate savings solely to social service and development agencies," Gutierrez said. "The government can imitate the system set in place in the proposed 2014 budget when lawmakers decided to abolish PDAF and realign funds to agencies without any lump sum funds given to the lawmakers,” Gutierrez said. While welcoming the neophyte legislators’ manifesto on the 2014 Priority Development Assistance Fund (PDAF), women’s groups belonging to the World March of Women-Pilipinas (WMW) and the Philippine Coalition for the International Criminal Court (PC-ICC) want lawmakers to ensure the complete abolition of the entire pork barrel system, and the punishment of guilty legislators and their conspirators. Women dancers who appeared to be lobbyists in formal attire started to occupy the Congress lobby at 2PM today, to make a clear statement that creative actions will be sustained until they see the people’s victory on this issue. The House Committee on Appropriations will be held today and the plenary debate is yet to happen on September 21. “The abolition of all forms of pork is not even assured yet, and they refuse to touch the President’s pork,” said Jean Enriquez, Coordinator of WMW-Pilipinas. 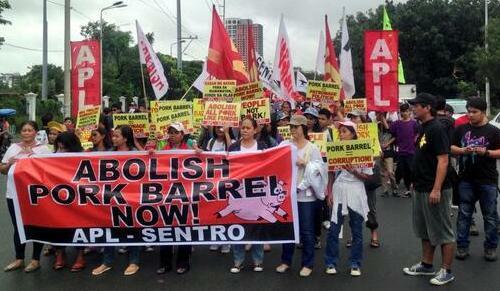 Enriquez added that the legislators’ basis for keeping the President’s pork is untenable. The neophyte legislators earlier said that it cannot be touched because it is meant for calamities and emergency situations. “It has already been proposed that the calamity fund within the Special Purpose Fund (SPF) could be allocated to the unit on climate change or disaster management. The other items under the SPF should similarly be allocated under the regular budgets of the pertinent government agencies,” remarked Enriquez. “We propose that a reallocation of pork be towards social services, such as preventive and integrative healthcare,” according to Pangging Santos of SARILAYA. “Malacanang’s reasoning that the SPF does not come from people’s taxes but from contributions of the Philippine Amusement and Gaming Corporation (PAGCOR), among others, is non-sequitur. 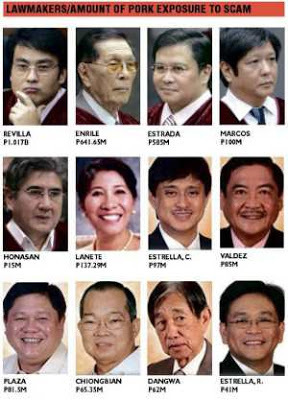 This is still public fund – the people’s money,” according Enriquez.